As reported in the world media on 3 October 2009 over 10,000 passwords lodged with Hotmail, Yahoo and Gmail were compromised. Unfortunately, BASSATINE NEWS was among the many casualties. From that date onwards, we have had no access to any email sent to "bassatine@yahoo.com". Similarly we were no longer able to administer our BASSATINE NEWS website domiciled at Yahoo-Geocities. Moreover, we no longer have access to our invaluable mailing list attached to our old Yahoo e-mail account. As a result of this transgression and in order to limit the damages resultant, we asked Yahoo to suspend our old email account AND to remove our website from their hosting service. Conversely, and in order to continue to service the community at large, we have moved our website to a different hosting service. We apologize for not replying to all those who e-mailed us at our old address between October 3 and now but as explained, the situation remains beyond our control. Since we are unable to reach all our valued readers, we ask you to inform friends of BASSATINE NEWS of the new changes. Rest assured that we look forward to serving you in the future with the same dedication that kept us going for the last 15 years. This year we celebrated Hannuka on Sunday the 13th of December in Shaar Hashamayim Synagogue, three days after this holiday actually started. Each year, I fret as to who will pray with us to celebrate this feast with our small community. Many years ago there were the annual visitors of Abu Hassira who would fill the Synagogue, but nowadays the Mulid of Abu Hassira falls in January. Or else there was the group of Rabbis commemorating the reading of the book of Maimonides. They arrived just in time to help with the Hannuka candle-lighting bringing with them cakes and the traditional "kraffen" or doughnuts. Hannuka, as you may or may not know, is a traditional religious feast commemorating the regaining of the Temple of Jerusalem by the Maccabees. The Temple had been occupied by the Roman troops of Antiochus. When the Maccabees finally went into the Temple and wished to offer thanks to God, they found only one cup of olive oil that had remained pure. They lit the oil lamp thinking it would last one evening. Yet when they returned in the morning, they found the oil in the cup intact. The bewildered Maccabees lit it again! The oil lasted eight days. This is why we have a Menorah (Jewish candlestick) with eight branches and one at the back standing as guard. Ever since, Jews have celebrated this event lighting a candle each night for eight days during Hannuka.  It is also said and I personally strongly believe it, that a miracle is due to occur. 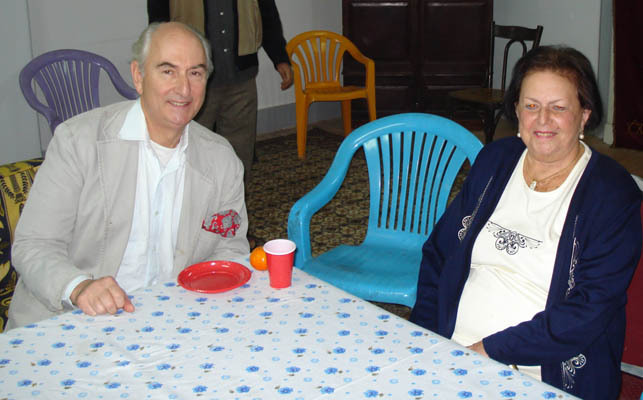 As far as I am concerned the miracle occurs here in Cairo at the beginning of each feast, when somebody arrives unexpectedly from abroad and offers to celebrate with us. This year Rabbi Andrew Baker came to Cairo to attend a conference on anti-fanaticism of all sorts. He said he had come one day ahead to see us. As president of the JCC, I resolved we should celebrate Hannuka come what may. It was the right decision, for out of the blue, many members of the Israeli embassy with their family showed up as well as Jewish and non-Jewish expats and their friends. And of-course there were the ladies of the community in their best attire. 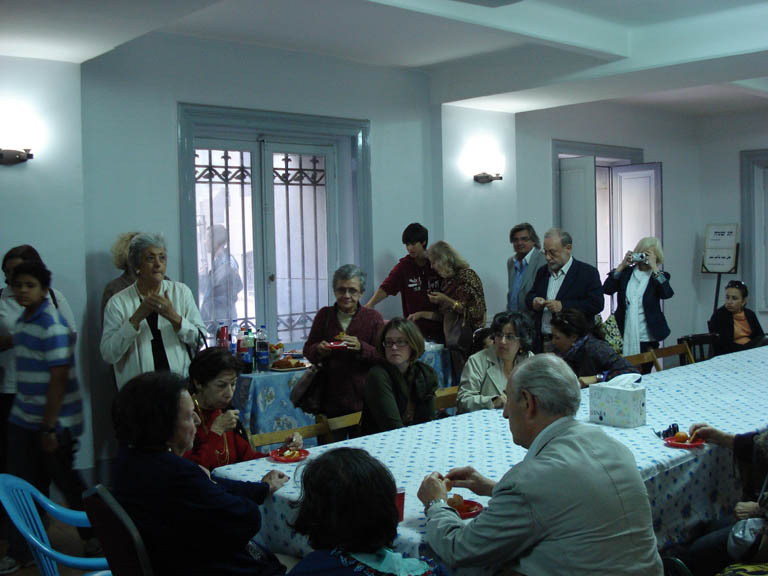 After a short service and the lighting of three candles, as it was the 3rd night, we all moved to the reception rooms of the Adly synagogue where a light dinner and the traditional jam KRAFFENS were offered. One of the visitors played some lively tunes on his guitar and everybody was in a joyous mood. 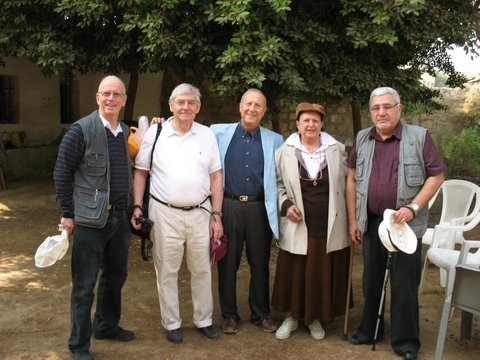 When Jean-Michel Tivoly and his group visited Bassatine Cemetery a few days after Hannuka it was in order to say a collective prayer for their dear departed. They had read about the disappearance of most of the plaques and that the battle to maintain the cemetery was uphill all the way. 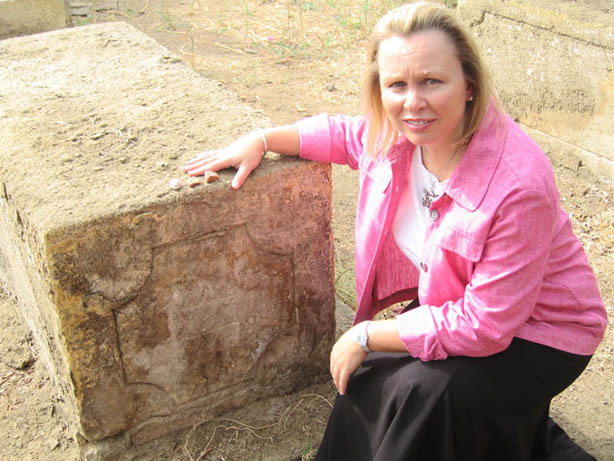 It was therefore with untold joy when a member of the group found his uncle's grave almost intact! Tivoly Co. is a leading European cutting tool manufacturer. I was desperate as I watched the 13th century Maimonides Yeshiva deteriorating day after day due to the underground water problem. Truth be said that the Maimonides Yeshiva and the adjoining 19th century Synagogue had been restored twice during the second half of the 20th century thanks to donations from Mr. Clement Waturi (France). Unfortunately, said works did not withstand the rising water table and the serial misfortunes that befell this venerated Jewish landmark. As far as I can recall, one of the these mishaps was when the Synagogue's wooden roof caved in just before Nasser's death in 1969! There was also the earthquake of October 1992. All one could wish for was that someone would help us raise the necessary funds to save the Yeshiva. Someone who could bring its plight to world attention. I thought this 'someone' could be reporter-author Lucette Lagnado. She appeared on scene with a hatful of promises but these ultimately translated into a discouraging description in the Wall Street Journal. Rav Moshe is in "shambles�"; Shaar Hashamayim "desperately faded"; Temple Hanan "shabby and unbearably sad..." as though this state of affairs was due to the neglect of the Jewish community of Cairo! Meanwhile, the AJC whom I had called for help to set a plan for preserving our patrimony after we are all gone, seemingly had other thoughts in mind. Ditto the Nebi Daniel Association of France and England which embarked on other projects. My desperation increased, more so each time I visited Rav Moshe in Haret El Yahud. 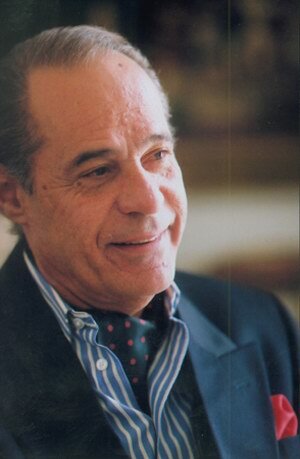 But my prayers paid off when one day I received a call from talk-show host and TV commentator Tarek Habib. 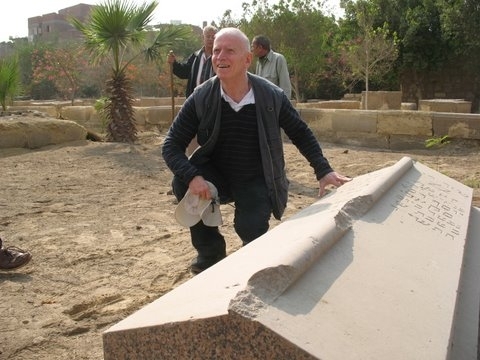 He wanted to do a TV docu-series on the Jews of Egypt. "How much can you donate to the JCC if we come to an agreement?" was one of my questions. Mr. Habib categorically refused any financial arrangement arguing that he never paid for filming documentaries. Instead, he promised to introduce me to Dr Zahi Hawass, director of Egypt's Antiquities. True to his word, Mr. Habib set up the meeting. With a racing heart and a fat file I marched into Mr. Zahi's office. 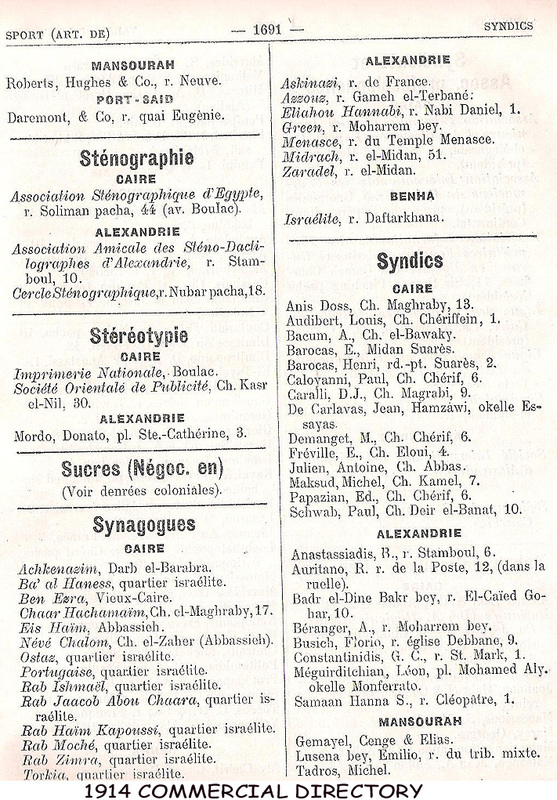 The file listed the Jewish Synagogues and landmarks in Cairo including a detailed description of their needs. 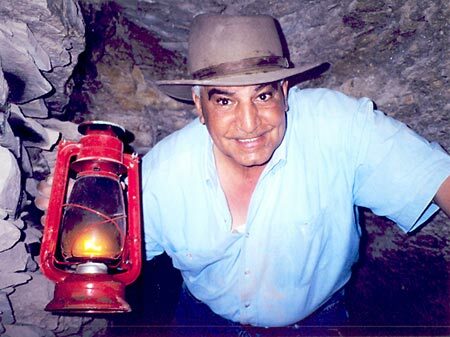 Zahi Hawass was adamant. "We can start with two Synagogues only; which are your priorities?" 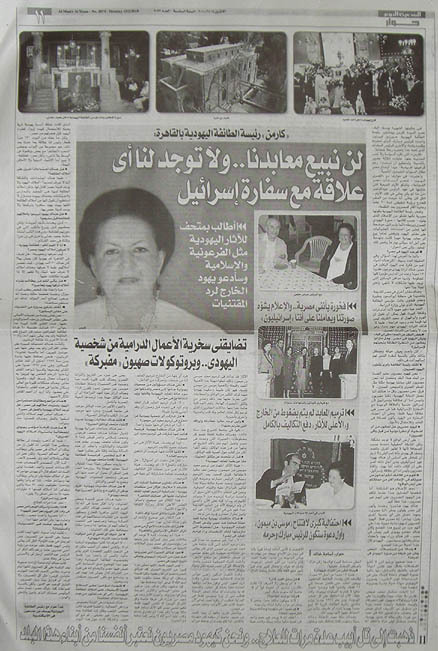 My answer was unequivocal: "Shaar Hashamayim" since we wished to celebrate its centenary already two years past due. Second choice: Maimonides which is so close to the hearts of all Egyptian Jews. Immediately work started on Shaar Hashamayim beginning with the facade followed by the marble Bima which suddenly collapsed during the works! Meanwhile studies for the restoration of Maimonides were already underway. Upon disbursement of the state-allocated 8.5 million Egyptian pounds work on the venerated site commenced in August 2008. As I write these words the 13th century Maimonides Yeshiva is under restoration and the adjoining 19th century Synagogue is about to become its original self. Equally important, the underground water which caused so much damage is being diverted. At the same time across town the Karaite Synagogue in Abbasia is being restored as well as Rav Hayyim Cappucci. Works on the Adly synagogue are nearing completion and passers-by will notice that the sidewalk has been paved in granite as was the passage leading to the Synagogue�s alley entrance. Next on the list of restoration is Rav Hayim Synagogue in Haret el Yehud. If all goes according to schedule, we hope to celebrate the restoration of Rav Moshe early 2010 God willing in a manner worthy of that great philosopher, doctor and religious scholar whose fruitful life intertwined with Egypt where he lived and died. And for those among you who want to know whether or not Mr. Habib produced his documentary on Egypt's Jews, the answer is, "not yet". 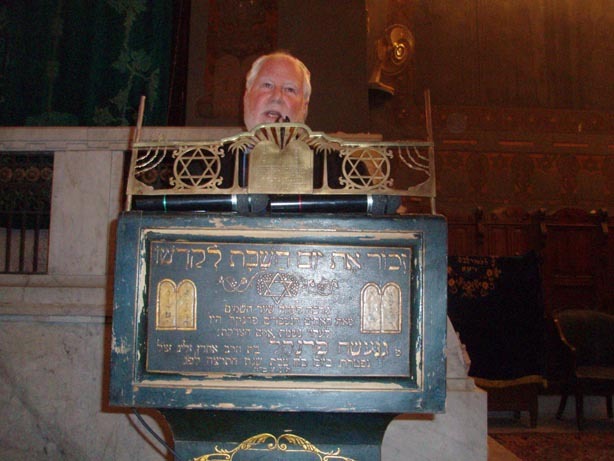 To be honest I don't know if he still intends to, but what I do know is that his unplanned contribution to the restoration of Cairo's Jewish landmarks has been invaluable. 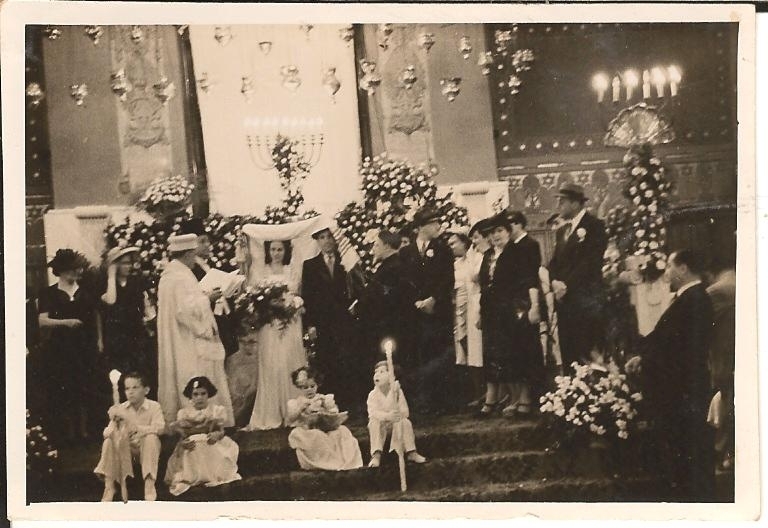 click HERE to read about the last Jewish wedding (1984) to take place at Shaar Hashamayim. 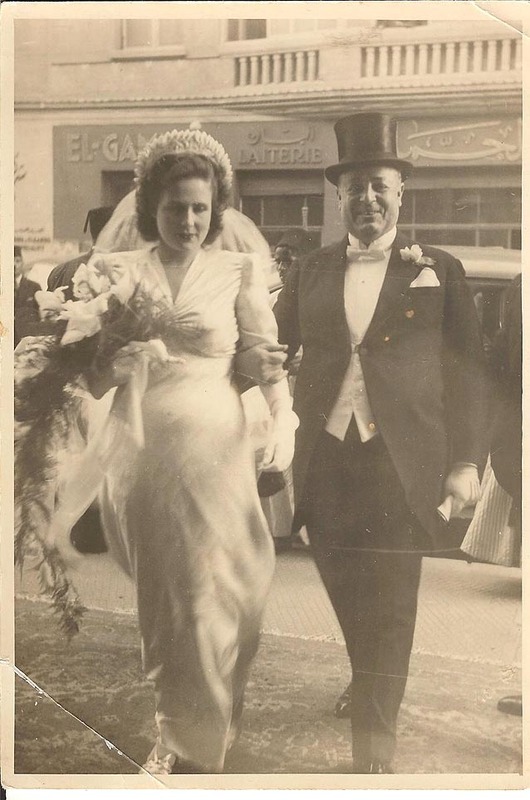 Groom: Benoit Salem; bride: Flora Fabienne Rousseau. Photo of Candice Kiss from Waltham, Massachusetts laying three Dead Sea rocks on grave of a friend's grandparents and uncle at Bassatine Cemetery last October 2009. Candice Kiss was a member of the U.S. Delegation to Egypt of the Susan G. Komen for the Cure Organization (www.komen.org). Susan G. Komen for the Cure is the world's largest grass roots organization fighting breast cancer. Susan G. Komen for the Cure organized the first-ever "Race for the Cure" around the Giza Pyramids to promote breast cancer awareness in Egypt. There were nearly 10,000 participants, including her Delegation, who participated in this 1.5k race/walk. 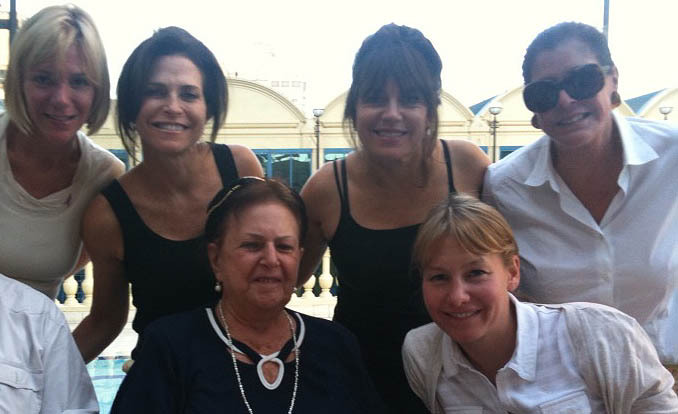 The photo below shows Candice and her friends all of whom made the very special trip to the Bassatine Cemetery and other Jewish sites of Cairo with Candice. "Thank you to everyone at Shaar HaShamayim, Ben Ezra, and the Bassatine for all of their assistance and kindness. They did a great mitzvah in welcoming us so warmly to the Jewish sites of Cairo. It was simply the most wonderful instance of 'bashert' to find you sitting by the pool at the Four Seasons! I wish you good health and much happiness, and hope to meet you again on a return trip o Egypt." 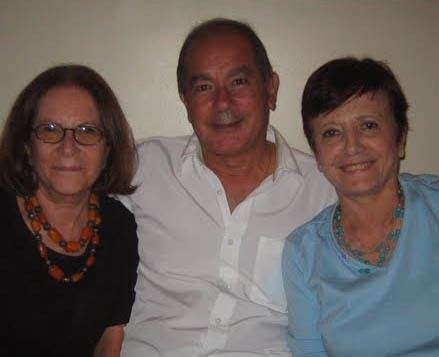 Another much appreciated October visitor to Egypt was culinary artist and Chef Andree Abramoff, nee Levy and formerly of Bab al-Louk/Tewfikieh Cairo and since the 1960s a resident of New York and the Hamptons along with her husband Charlie Abramoff (formerly of Alexandria). For years Andree ran the famous Manhattan restaurant on East 74th Street "Crocodile" named after the big eaters of the Nile. But according to the New York Times, Andree had another reason for her restaurant's name. "Crocodiles are voracious eaters and so are my guests!" Currently Andree is writing a book on her parcours across several decades soon to be published in New York. 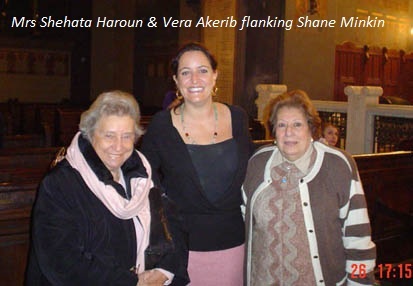 About 35 members of The Association of Friends of Manial Palace Museum (FMPM) headed by HH Prince Abbas Hilmi visited the Synagogues of Ben Ezra and Shaar Hashamayim on Saturday 21 November 2009. It was during the reign of Prince Hilmi's grandfather (Khedive Abbas Hilmi II r. 1892-1914) that Shaar Hashamayim was constructed and inaugurated. 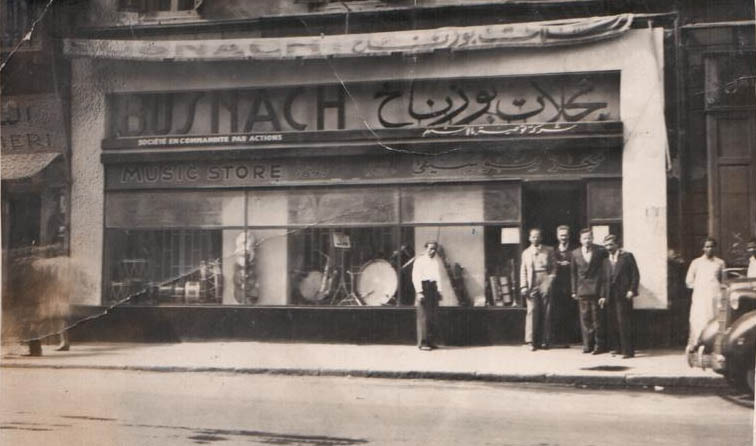 1950 "Agents and Distributors Who's Who - Egypt & The Middle East"
Photo of Maison Busnach dealing in wholsale musical instruments located at No. 20 Ibrahim Pasha Avenue (today Goumhouria Street). Founded by Natale Busnach in 1897 Maison Busnach was later managed by his widow Rachel Moise Isacoff who lived with her accountant son Dr. Albert Busnach at No. 7 Amir Fouad Street (today Dr. Mahmoud Azmy Street). Elia Natale Busnach was one of the donors for the construction of the Bassatine cemetery wall in 1990. The first sign says it's a National Democratic Party (NDP) office. Another establishes it as a Ministry of Social Solidarity local unit. A third sign claims it belongs to "El Wayli Kindergarten." But really, the building is a synagogue, a Jewish house of worship. 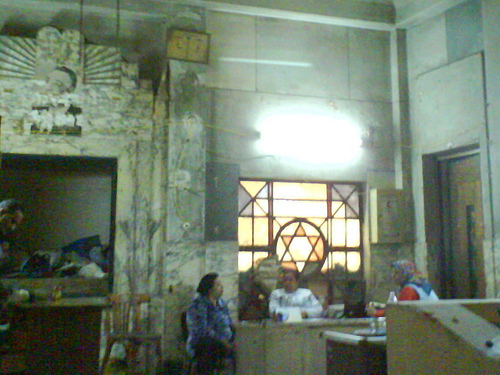 Curious pictures of this Cairo temple were first posted by Egyptian blogger Mostafa Hussein last year. The photos, which showed a sign of the ruling NDP in front of the building's main door and a handful of employees working inside, generated a buzz in the Egyptian online social networks like Twitter and Facebook.